Today I ran in my third Rock N Roll Half Marathon in Virginia Beach. It should be my last. I think that every time I race in VA Beach I say that I shouldn't do it anymore though... I at least need to start reevaluating my goals heading into races while I'm sick. It was also the third half-marathon I've run in 2010 while ill--Shamrock, Historic Half, Rock n Roll. Anyway, being sick I should have tried to run slower. Instead I went after a PR. I started with the elites, right behind them, and dropped back immediately at the start. I was too close to Charlie in the first 400 meters so I kept on falling back. Andrew 3.0 and John Piggott went ahead of me, but I figured I'd see them again soon. My first mile was 5:33 and I was already breathing hard and shooting lots of snot out. The weather was really nice if you weren't in the sunlight or a place without wind cover... in other words it was hot and windy. But the 2nd mile was shaded and the wind was at my back so I got a little cold and moved up with a 5:34 to close a bit of the gap on 3.0 and John. A 3rd mile in 5:35 put me right with them, and I made a comment about wanting to keep that pace up and called John an old man. Foolish. We slowed down on the next mile to 5:40 and I moved to the front to keep the pace where I needed it to PR. Mistake. After a 5:36 I felt dead. I was starting to feel my lungs close up and I fell off a little bit. I worked really hard on the 6th mile to run a 5:39 to get back on 3.0's heals and pass John. Approaching 10k 3.0 turned around and said something about me passing Wardian. I asked him to repeat it and realized I had no breath in my lungs and he was gone. I encouraged John to get back up with me but that was a mistake too because he then pulled away as I ran a 5:54 and 5:57 for my next two miles. We were running around in circles in Camp Pendleton and I hated it. There were so many turns that showed me down each time, and there weren't any people standing at the turns to tell us which way to go. I wasn't ever sure where to go until I saw 3.0 go first. He later shared that he was having the same doubts, as was Charlie. The rest of the race was just a struggle. I couldn't breath and I didn't want to hyperventilate, but I was running as hard as I could. I tried to pick it back up and at least get down into the 5:40s, but instead I ran the rest of the miles over 6:00... Before going back over the bridge I ran into a runner coming the other way who was running on the wrong side of the road with an iPod on. He jumped out of the crowd and wasn't paying attention-- I didn't have time to react other than to put my left shoulder into him and keep on going. Outside of Pendleton is was all headwind, save for a brief time running south on Atlantic. The miles were just taking forever, in stark contrast to the first mile, which I thought arrived surprisingly quick. I wanted to stop running and just sit down, but dropping out wasn't really an option. I got onto the boardwalk, put my head down into the wind, and just gave it all I had for the last mile. I managed to not slow down anymore the last 4 miles... all at 6:10 & 6:11. My last 0.1 was in 37 seconds, which I thought wasn't too bad, but I was basically holding my breath and hoping not to die. That's what a kick is though, right? No one was happy with their race amongst the Team Virginia guys who I ran in Chicago with. 3.0 ran about a 60 second PR though, so that was great for him. Team Blitz lives on. 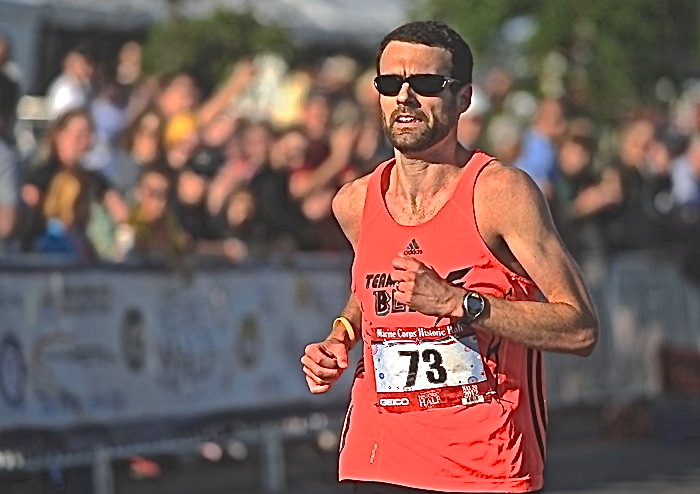 Also Nick Patin was in the race, wearing the same black singlet I was wearing. That was definitely the highlight for me. He joined us for a little bit of the cool down, which I thought was way too long. All in all it was pretty crappy. I got 27th place, but 30th behind 3 women, and was 4th in my age-group, which somehow didn't include Charlie. I will be reevaluating my goals for Twin Cities in the coming weeks as I'm 4 weeks away from that effort that will be twice the distance, time, and pain as this weekend was.